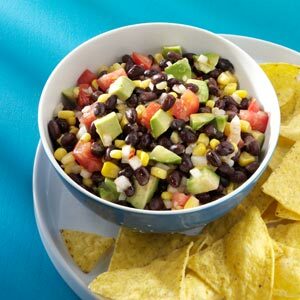 Black beans, corn, tomato, and avocado - what could be better together? In a bowl, combine the beans, corn, tomato, avocado, cilantro, and onion. In a small bowl, whisk the oil, vinegar, salt and hot pepper sauce; pour over bean mixture and toss to coat. Serve with tortilla chips if desired. Yield: 8-10 servings.